In the name of God, and with His blessings, we inaugurate the second ordinary session of the Eighteenth Parliament. At this key stage in our democratisation process—marked by continued achievements—we commend the efforts recently exerted by this esteemed assembly in cooperation with the Government, which were characterised by constructiveness, and a spirit of responsibility and partnership. This has resulted in the endorsement of a package of vital legislation encompassing several key sectors, in line with our keenness to develop the performance of the Judiciary, enhance the rule of law, and nurture the foundations of our civil state. I urge you to continue with this approach of cooperation between the executive and legislative authorities. As we stand today in this bastion of Jordanian democracy, we proudly recall Jordanians’ latest milestone of electing municipal and governorate councils, launching our experience in decentralisation as we strive towards cementing democracy and empowering local authorities to assume wider responsibilities in development-related decision making. This achievement also reflects Jordan’s unique, steadfast and incremental reform model, to which Jordanians remain committed amidst unprecedented regional challenges. The opening of the second ordinary session of this Parliament is an opportunity to highlight the urgent issues that were detailed in the Government’s performance report for the past year and published in June, as well as in its policy statement, and in the last two Letters of Designation. 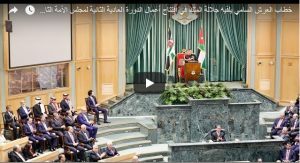 These priorities require the utmost engagement from this esteemed assembly in terms of oversight and legislation in the service of Jordanians, whose security, dignity, and right to a better future are the goals of all exerted efforts. In order to achieve these priorities, the Government must work to implement the Jordan Economic Growth Plan over the coming years, endorsed to boost economic growth and to capitalise on all available regional and international opportunities to improve citizens’ standard of living, support the middle class and protect low-income families. The Government must also continue to implement the National Strategy for Human Resources Development and see through the e-government programme to transform into a paperless government. I have constantly asserted that Government must remain transparent, realistic and proactive, without hesitation. With the phase of strategising and planning complete, the Government must now focus on effective implementation, for it is up to us to take matters into our own hands. No one will solve our problems but us. We must harness our will, potential, and energy to confidently and resolutely take on the challenges before us. Our success in forging ahead on the path of growth and prosperity, and countering the forces of evil and the khawarej of this age would not have been possible without the unity and solidarity of Jordanians. Here, let us also pay tribute to the relentless efforts of the Jordan Armed Forces-Arab Army and security agencies to safeguard the homeland, its prosperity and independence, day and night. To them, we give a salute of respect and appreciation for their sacrifices and heroisms, and we commit to supporting them to undertake their sacred duties. Jordan will continue to uphold its historical role as defender of the causes of our Arab and Muslim nations, foremost of which is the Palestinian cause and the establishment of an independent Palestinian state on Palestinian national soil, with Jerusalem as its capital, as well as safeguarding Islamic and Christian holy sites in Jerusalem. I ask God Almighty to grant us the will and determination to fulfil our responsibilities and serve our beloved people, country, and Ummah.